Great watch , definitely helps improve the game, and the downloadable app is addicting as it keeps track of your clubs and shots. Played 2 rounds with it so far and I love it. Distances are accurate and I love using it the lay up and hazard distance options! Also the activity tracking makes it a great everyday watch. ProsLay up and hazard distances are awesome! ConsA little thicker than I wanted but I?m getting used to it. After getting rid of my unlimited data cell plan, I needed a good GPS since I could no longer use the apps on my phone. I borrowed a friends laser rangefinder and left it at 3 different courses, so that wasn't going to work. On a whim I decided to try the Approach S20 based on the good reviews and affordable price. It was easily the best money I've ever spent on a golf accessory. - Pretty slim and I didn't even notice it on my wrist while hitting shots - Almost never had to press buttons unless I wanted to check distance to a hazard, which was extremely intuitive and was easily accomplished while walking to the tee box - Bright screen let me see the display easily throughout the entire round with nothing besides a quick glance - Moving the pin was simple and brilliant for dialing in exact yardages - Started the round with 97%, 18 holes later it was at 75%...shut it off and placed in the valuables pocket of my bag it will be ready to go for my next round. Overall I don't think there's a better watch on the market right now for the easy to use features in a sleek affordable package. I love the big letters, it really helps when you're older. The watch is much better than expected. Looks great and works well so far. Haven’t had a chance to try it out on the golf course yet though. Very easy to use and battery lasts a long time. ConsSmall detail but I wish it had a vibrate feature for the alarm instead of just beeping. So far, this has proven to be an excellent purchase. Great size, easy to operate, and nearly perfect visibility! The watch arrived early and looked brand new. Couldn't tell it eas refurbished. I have used it numerous times and it is easy to use and accurate! Good battery life. The only issue I have is that the step counter is not as accurate as my Fitbit. The Garmin 'cheats' me out of steps. Product is as advertised— like new. I have played 3 rounds and love the watch. Easy to use features, distances and scores accurate, and holds charge. Highly recommend. great watch go get em! So far the watch has been working great! The watch performs as expected. It arrived in excellent condition and was seamless to set-up. Looks great and holds a charge...Great product for the price!! Watch is lightweight and comfortable. Display good clear visibility, also in full sunlight. Shows back middle and front of green. Distances update fast ans accurate. Also it has a few "smart watch" features, like it can show you received messages and you phone. ConsDid show hazzards, but not all like trees on fairway that other brands did show Wristband looks a bit fragile, time will tell if it will hold up. 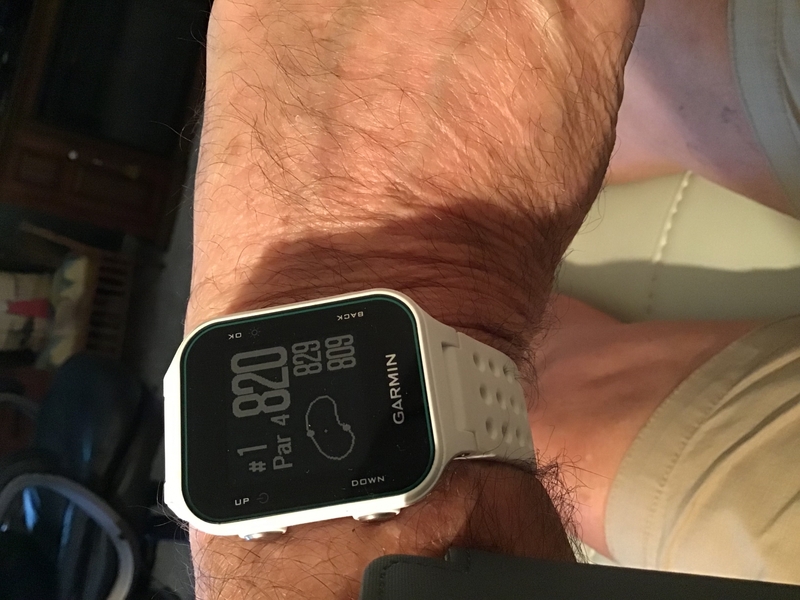 After receiving the Garmin Approach S20 GPS watch, I was excited to use it as it appeared to be easy to use and provided enough information on the golf course that it surely would improve my game. However, after only wearing it for 2 9 hole rounds of golf, the strap broke (actually the rubber strap that holds the main strap in place after it is placed through the buckle). While I can still use the watch, I have to carry it in my pocket and have great concerns about the durability of this watch. I gave it two stars because I think in general, the watch itself is a good idea, but practically, the quality of workmanship doesn't hold up at all. 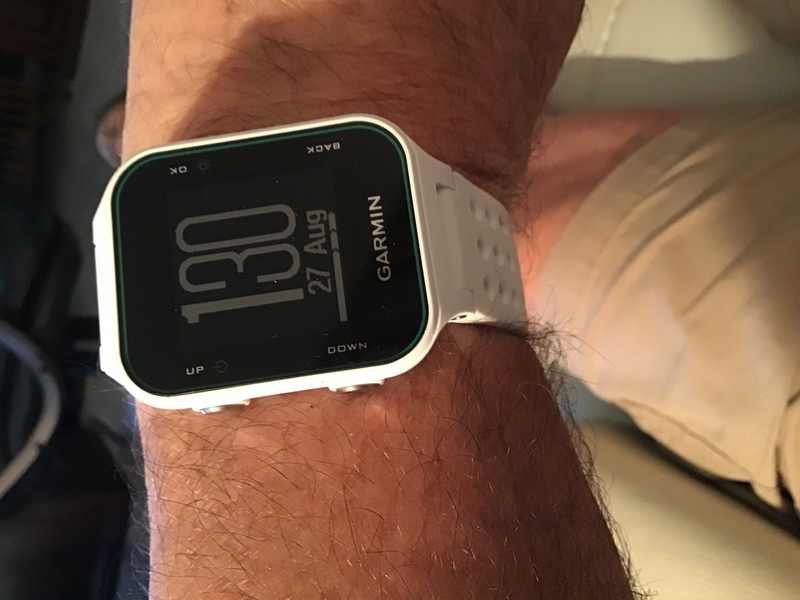 Played several rounds with the Garmin S20 and it was very accurate and easy to use. After two 18 hole rounds the gps says I still have 50% battery life left. I had an older Bushnell watch that I got good service from but it had two shortcomings: 1) the charging clip was inconsistent in making a good connection and 2) the update software could not be used on my iMac desktop computer. I have two other Garmin products: a Nuvi car map GPS and an Approach handheld Golf GPS. They both use the same very simple to use update software so I only considered Garmin when shopping for a new golf watch. I ordered my watch and received it quickly. I plugged the supplied cable to my charger and clipped the charging cable to my watch. Much to my relief it was a very simple fitting and the terminals made a good connection that has been repeated many times. No more fighting the terminal to get a connection-although the manual warns that cleaning the contacts by wiping them with a damp cloth is a must. I used the cable to connect my iMac desktop to the watch and it used the same software I already used for my Nuvi and Approach to update the watch. So my two major concerns were addressed. 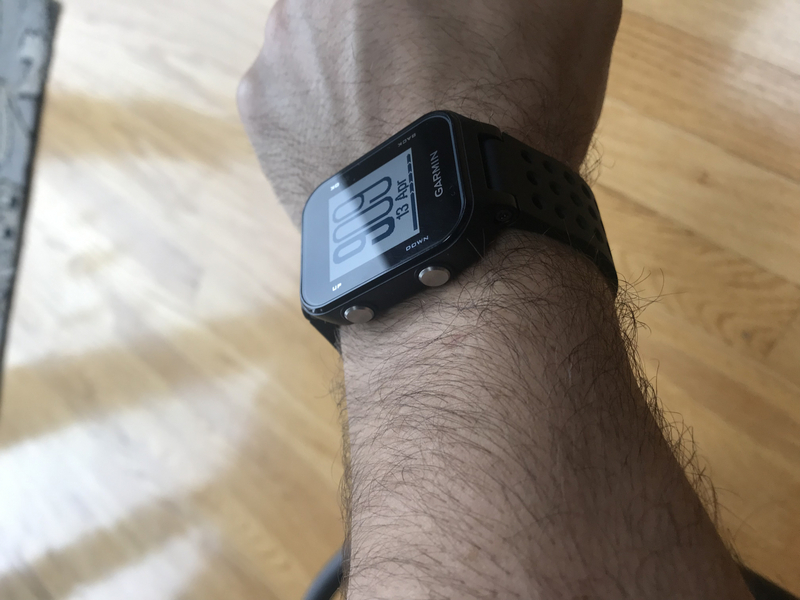 The watch will do a number of things that I don’t use: keep score, interface with my smart phone, count steps, keep mileage, etc. I only use it for golf yardage and it is consistent with my laser, which means it is accurate. It shows the front, back, and middle of the green and has a feature for you to move the hole on your display for more accurate yardage. The watch is much thinner and lighter than my old watch. It comes in black which makes the dirt less visible. As a watch it keeps the time and knows what time zone you’re in. I’m not sure how long the charge will last, but it is certainly long enough that it hasn’t been an issue for me. I recommend this product - especially if you have other Garmin devices. Accurate gps watch with good battery life thus far. Cost is reasonable too. No problems at all first time out. Accurate yardage and the additional options helped out great. hazards and lay ups. Consno color, and wrist band can be a little uncomfortable. ProsI always know what time it is. And almost never late. Not only keeps score but records steps, calories, sleep patterns, etc. Seems to be accurate as to yardage and I like the idea I can change the pin placement. I highly recommend. Finds courses easily and I don’t need to have my cell phone in hand to check range. Easy to use for us less tech savy people. Does all the basic golf things you would expect but also just really good day to day, step counter is nice extra touch and battery is awesome, have had it on for 3 weeks and battery is still at 56%. Haven't got into advanced golf mode but looking forward to analysing shots after my round. Works Great. It has long battery life. The Garmin app works great for tracking stats and scores. ProsEasy to read large numbers. Tracks steps and sleep besides being a GPS watch. I love it. Haven’t used it for golf yet but is great for calorie burn and steps. Awesome gps watch. Very easy to use. Gives accurate yardages and has an awesome battery life. Highly Recommend. Works great. Bought me another. Bought as a gift and I want one for myself. So far advanced as my garmin watch. Can sync with smart phone to receive messages and texts. Price was great from rockbottom and really fast shipping. Thank you rockbottom. Perfect for traveling golfers and the additional features make it a great everyday watch too. Have used many times on the courses in good and bad weather. All yardage are correct! The pedometer is a plus! Much faster attaining satellites and getting distances than my old watch. Lighter too. Love the watch!!! Seems very accurate. Very satisfied. This is heads over the Sky watch I had. Easy to set up and easy to operate. I use it daily for my activity tracker. Outstanding value for all the features. I ordered the S20 on a whim just to see if it would really work. The course we play has the GPS in the carts and the S20 matched it almost yard for yard. It also keeps track of your score and saves your rounds for later review. I just wish it would make me hit straighter. Great product. ProsIt has notifications and is really easy to use. It would be a great option for a fresher to start his/her golf training with Garmin Approach S20. Its long battery life and user-friendly features will help the user to do well either to be a usual golfer from nun-usual or to be a fit and healthy person from lazy and fatty person. The device is pressure resists up to 50m. Very satisfied with my new Garmin S20 GPS watch. It charges in super quick time and is very reliable on distance. I trashed my other GPS device due to poor charging and yearly fee to use it. Thanks Garmin! This literally does it all on the course. I've used mine for 5 rounds and the accuracy is outstanding. It's amazing how far off the GPS on the carts are in comparison. The features are very cool, and easy to learn. The only negative is you need to recharge more frequently than say a fit bit. In the grand scheme of things, it's not a huge deal to charge it when you get home. Bought this for my husband for Father's Day. He has been using it and likes it. Nice improvement over his original Garmin GPS. Nice style and nice color selection. ProsNice style, not too large and easy to read. Easy to program, not too many bells and whistles for your average golfer. This watch is great. It is light, the battery is assume, it also has text alerts all for $150. Its my 3 Garmin watch over the years. Does everything you will ever need and more. Accuarate and easy to use. Highly recommend.